Applying an audio FX plug-in to a pre-recorded track is easy, just patch it in the track’s FX field and click play, but did you know you could listen to your input with effects during the recording process? This hot new feature is the ability to monitor your input through the software itself, allowing you to use SONAR like a virtual effects processor or stomp box. Input Monitoring is not only available in SONAR, you can also use this feature in Home Studio 2002, Music Creator 2002, and Plasma. Have you ever wished you could listen to your vocalist with reverb and compression while they’re laying down a track? Some situations demand that guitar players hear themselves with distortion while recording, but you’d like the ability to adjust their tone later as the song comes together. This tech tip will show you how to monitor through a non-destructive effect, allowing you to change your mind later and switch to a different FX preset or remove the effect altogether. You’ll be left with a dry, unprocessed signal giving you the most flexibility. We’ve learned that this powerful feature isn’t exactly common knowledge, so we hope this tip helps you achieve a great sound during tracking. Sometimes that’s just what’s needed to coax a top performance out of your artist. 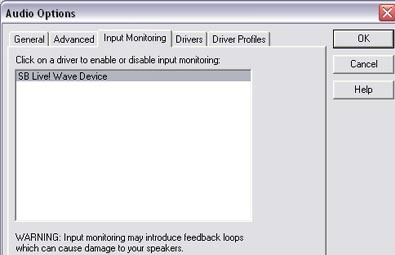 Input Monitoring requires Windows ME, 2000 or XP since those operating systems support WDM audio drivers. Some built-in soundcards may not be capable of Input Monitoring, or may do so with extreme latency creating a delay or echo effect. For a list of quality soundcards, check out our Open Audio Hardware Guide. Go to Options | Audio and click the Input Monitoring tab. You will see a list of drivers. Select the drivers that you would monitor through. Before you select this option, make sure you are not monitoring directly though your soundcard. You will get a nasty feedback loop if input monitoring is enabled in your sound card's software. With most cards, you can go to Start | Programs | Accessories | Entertainment | Volume Control, then mute your line or mic. When input monitoring, the biggest problem people come across is latency. Latency is the time it takes for hardware or software to process commands (or audio). Before you can get monitoring to work with out an annoying delay, you will need to make some adjustments in Options | Audio | General. 1) WDM drivers. Make sure you have the latest drivers from your sound card manufacturer’s website. Manufacturers are constantly updating drivers. Keep in mind that not all will have WDMs available for Win 98 or ME. 2) DMA buffer size. Most high-end cards (Like Delta, Echo, and MOTU) allow you to change this in their control panel or mixer. After you lower the DMA, you must hit the Wave Profiler button under Options | Audio | General for the changes to take effect. First go to Insert | Audio track. Right-click in the FX field under the track (you may need to stretch the track vertically to see it). Let’s add the FX Reverb. Now arm the track and speak into your mic or play the guitar. Make sure you see Audio Running on the bottom of the screen. If you see audio stopped, press the Audio Engine button or hit thespace bar twice. If you start to get Dropouts or the Audio Engine keeps stopping, go into Audio Options again and turn up the latency to about 20msec. Gradually bring it down until the delay is unnoticeable. Under the Advanced tab try raising or lowering the I/O Buffer Size up to 128 or down to 32. Now you are ready to use SONAR as an effects processor. You don’t have to be recording; as long as the track is armed you’ll hear the effects.